Interview & story by Peter Dawson, with editorial assistance from Ishah Dawson. pd: It would seem that Coloured Stone is constantly touring? BL: If I didn't enjoy touring I would have stopped 10 years ago but like I said it's hard work and you've got to be prepared to lug it and slug it out, and face all the brick walls, all the problems come to you. But I've stuck it out and the band's still hanging in there and we try to do our best. The inspiration comes from the places we travel around Australia, and friendly people. Our music is reaching the hearts of people and that's where our inspiration comes from, it gives us the strength to keep going. You've got to be prepared to get up and go, you've got to give your time for practice and things, and shower and you're off again. pd: Noeletta Young, from the young Darwin band Wild Water, has said Coloured Stone was one of the inspirations that got her into music. BL: I come across a lot of youngsters and they pour their heart out to me and tell me this. You get a good feeling when you hear that your songs are touching the hearts of young people. That they are looking for someone to look up to as a role model. In their life they've got nowhere to go, in the years of depression they feel distress. A young fella from Kalgoorlie (Western Australia) with his own band once said, 'When I first heard 'Black Boy' I was going to school, it gave me the strength and the motivation to get up and start a band, I'm in a band now'. He's played with us also and I gave him the chance to tour with us. Now he's doing the same thing that we're doing. I like to help young people, teaching them, help them out and I sit down and talk with them. They sit down and listen so I talk to them about what it's like to be on the road and to be a musician. That's life! Many musicians that have worked with, or have toured with Coloured Stone as roadies or engineers, have gone out and got really good jobs. One young man named Tony Lovett, who comes from Melbourne, toured with the band as a roadie for 3 years. He was nobody, only a young fella when he came with us. Then he went back to Melbourne... He's said being with Coloured Stone and out to places on tour has educated him more. He's come to an understanding, to go back and work. Now he's got top jobs working in government places because he's done work with us. pd: Can you tell us why you got involved in that concert to stop the uranium mine at Jabiluka? BL: The reason why I got involved was because I'd come back from recording and all of a sudden I got this invitation, a call from CAAMA saying "Inviting you to play for a rally in the campaign out at Jabiluka". I got this invitation and I thought to myself, "I've got to go and do it!" Up in Arnhem Land there's a spirituality... my mind is spiritual... I come from a background of tribe... tribal elders who believe in and are guided by the spirits. 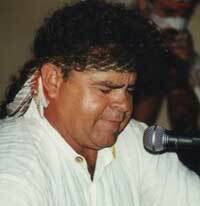 When I looked at Jabiluka, I said, well the Mirrar people have come to a consensus of an understanding, and because maybe I've got a warning from their spirits... you know, from their ancestor spirits saying "You've got to get that land back... you gotta stop it. Don't let them unearth this evil poison thing out of the ground". So somehow I believe that them spirits come through people. They work through people like me now talking. pd: Well your people are not that far from Maralinga (site of atom bomb tests) are they? BL: Yes, not far. I believe I've been spiritually guided to come into this thing. Give support because of the way I think... my concerns and my fears... and I was honoured to go up and support these people because I know that they're asking for help from other people. The spirits are also asking for other people, who have their spirits, give them support too and all come together and say they know these people. pd: Apart from the nationwide environmental issues that people are concerned about, are you also concerned from a spiritual point of view, from the Aboriginal point of view? BL: I believe the spiritual side is the earth. We have flowers, trees, you know, landmarks... we have water... we have bush tucker. It all comes from the earth and I believe that on this earth, that we were all put here by someone, OK, to be custodians of this earth. We were put here for a reason... to look after it... caretakers and custodians to look after it the proper way. So when I heard of that (anti-uranium) idea, I said "I've got to go and give my support", because you know, to help these people and they gotta make those (mining) people understand that it's wrong what they're doing. We were put here for a reason, to look after it the right way and treat it right... because those people there in years to come... over the last 50000 years their ancestors have enjoyed abundance of bush tucker food, like you know, hunting and things like that. pd: So they're giving something back you say? BL: Now the spirits are telling them, "In time to come, you're gonna have none of that. Ain't gonna be no more bush tucker, if you let that (uranium) outta the ground this place is going to be poisoned. It's going to turn a Garden of Eden into a desert, dry as arid stone. That place is going to be as dry as anything." So that's how I believe it, when I come up and give my support and my side of things too. I have my strong spiritual feelings about this... that we come up and give our support. We can't let them do that. We've got to stop them. It's wrong and it's dangerous... it's got to effect not only the Mirrar people but all... everybody in Australia. You look at Australia; it's one big island. pd: And it is one world we live on isn't it? BL: Everything over there in the next 20 to 30 years is going to spread slowly; we are all going to get sick inwards and outwards. BL: Chernobyl... Chernobyl is still going on. How many people got sick through illness... poisoned? You look at that thing that was on "60 Minutes" about a month ago, about Uzbekistan, where the sea turned to desert over 60 years... when people didn't listen to the signs, didn't realise. Diverted all the water, channelled it into growing cotton so they could make money. Natural resources for the people who lived off the sea for fish and now you look; it's a desert of rusty boats... big ships out there just sitting doing nothing. pd: Happens a bit in this country too doesn't it? Tune into In Didj'nÚs on 99.9 Bay FM every Thursday 2 to 4pm.